Using painter’s tape, mark off your desired design. Make sure you press the tape into the creases and that it is adhering, duct tape might work well too! Using our favorite go-to, acrylic paint, and a sponge brush, dab the paint into the design. Depending on the saturation of the paint and the shoe’s material, you will probably need a few coats. But, it dries quickly, so once it’s set, remove the tape. In only minutes you’ll have one-of-a kind shoes. Slip ons via K-Mart, and shorts are thrifted Wranglers cut off above the knee. If you upgrade any shoes, link in the comments, we’d love to see! And can we just say we hope you have the happiest weekend! 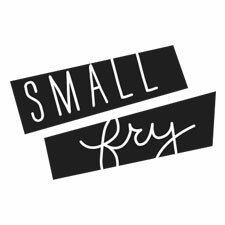 It has been an incredible week for Small Fry, and we are on cloud nine. The morning we launched the site was taking minutes to load because so many of you were here. We were laughing because while you were reading our motto, we were either scolding or ignoring our kids while we frantically tried to troubleshoot. We are doing this for our boys, and to be better mothers, but we are definitely not perfect. While we work out the kinks in life and online, we hope you know how much we value and appreciate your support. We hope that we can show you even an ounce of what we’ve felt in return. lovin this! totally simple.. why havent i done this yet? Do and show us when you’re done! Heather, how have we not met yet! Heard so much about you. Thanks for saying hi and we hope to meet you soon! You amazing moms! Lovin’ this new site! Thanks for sharing all this great stuff with the rest of us moms. pretty cool! will do this! We’d love to see it when you’re done! Duh why did I never think of this! Amazing! These shoes are really cute and I like the little painted stripes on them. Little boys really do destroy their shoes. I have two sons myself. Yey! Yay for boys! Thanks for stopping by. what a lovely blog! i’ve been talking to everyone about it since you launched it. i’m a fan of fabulous emily at ruffling feathers and just followed her over her. i am definitely going to try this little shoe project. thanks for sharing! Ah, thanks Emily! We appreciate your support so much! love. obsessed already. your grams are my favorite, and now a blog. cant wait to try this…hope i don’t foul it up. please update lots, pretend you aren’t busy with cute little mister’s ha. thank for being here! no way you can botch this up. if you post about it please let us know! Haha! We’re sure you’ll nail it! Good luck! Haha! Send me the link, girl! As a mother to a one year old boy myself, I’d love to see more of your inexpensive staples for boys. They have the best style! I don’t have kids, but I want to do this to my own shoes! when you do post it & let us know! Welcome to the two boy club! Best place to be. We’d love to see your end result if you end up doing it! What a fabulous idea! And Kmart for those darling shoes?! I’m stopping on my way home:) I have one boy and another on the way…reading your blog makes me feel like I’ve got sisters in the Boys Club! Would you believe if we told you that most of our friends have only boys! It’s crazy. There’s at least 7 of us. Welcome to our club! I LOVE this idea, super cute! so excited about this site (i found it blog hopping/stalking)! especially since you all have boys! i just had my second and i feel like so many of the blogs i read are centered around baby girls, i can’t wait to see more ‘threads’ posts! Pingback: Las Zapatillas de tu peque, ¡Crea tu propio diseño! | DIY: Hazlo tu... | Las Zapatillas de tu peque, ¡Crea tu propio diseño!